Here are some steps to follow so you can have two Modern City Tramway trams, one in MCT Blue Line livery, the other in MCT Green Line livery. Ryan's download mctngt8d.zip (2Mb, 02-Oct-02) includes a blue graphic and green graphic so it's just a matter of creating two folders and doing a bit of file name changing with a couple of edits in the ENGine files to keep MSTS happy. Note that there are other NGT8D trams in other liveries - that's the reason names are prefixed with mct in this write-up. Ignoring the sound files for the moment, with mctngt8d.zip loaded into WinZip, select all the files that have the folder path ngt8d, except the green ACE, and drag'n'drop them into mct_ngt8d_blue. Repeat the above, this time selecting the blue ACE and drag'n'drop into mct_ngt8d_green. While you've got Explorer open, now would be a good time to rename the ENG files so they correspond to their respective folder names. There are 3 ENG files in each folder so rename them as given by the headings below, repeating the process for the Green tram. The sounds included in mctngt8d.zip are the T4D sounds by Alexander "Magdeburger" Pohlemann. You may already have these sounds in t4dsound.zip (1.6Mb, 16-Jun-02) from TramWorld. Because they can be used by all trams, they should be installed into Common.Snd in their own sub-folder, T4D. If you haven't got them there, do that job now by making a new sub-folder under Common.Snd and drag'n'drop from mctngt8d.zip. 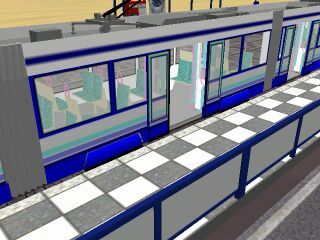 For a cabview, webTrainSim tried the default MSTS Series 7000 cab but, while attractive, it is much too high above track level and oncoming trams appear as toys. So webTrainSim has settled on Kenji Kimura's S-Bahn RE450 cab Re450Cab.zip (2Mb, 12-Feb-02) from www.thetrain.de or www.chez.com/aardvark/. This cab will get wide use in your trams so include it in your Common.Cab folder. You'll have to paste the full folder path for each graphic in the CVF file, Re450.cvf. Note: before editing Re450.cvf in WordPad, clear the file's Read-only attribute. Below are the changes for the three ENG files for the Blue Line MCT tram with the necessary changes. Repeat for each ENG file for the Green Line MCT tram. The final step is to use ConBuilder to create a consist for each tram, naming them mct_ngt8d_blue.con and mct_ngt8d_green.con for easy identification. The Berlin Tramway (Strassenbahn) TM36 tram (with cab and sounds) version 2 from MSTS Netherlands StrabaBln2.zip (4.9Mb) requires a change to the cabview file, Straba.cvf, so you can see out the front.